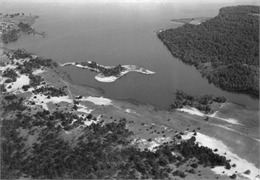 Aerial View of Lake Delton, 1930 ca. On June 9, 2008, a historic flood washed out Lake Delton, a recreational destination integral to Wisconsin Dells tourism. People were astounded and naturally asked how an entire lake could disappear. The answer lies in the fact that Lake Delton is man-made and has its own unique story. The modern-day town of Lake Delton was originally named Norris, after the surveyor who laid it out back in 1849. The village, which sat next to a pretty little valley, was soon re-christened Delton. Over the next decade it became well-known for making wagons, buggies, cast-iron plows, and other implements. The stamp or label "Manufactured in Delton, Wis." quickly came to stand for high-quality craftsmanship. After the Civil War, wagons and agricultural equipment began to be made more cheaply in larger factories elsewhere. When the railroad by-passed Delton, its business owners followed and the village withered. A visitor in 1924 described the deserted town as "only a name, utterly meaningless to the thousands who may pass through it during the [tourist] season..."
Luckily, the very next year an imaginative Chicago millionaire named William J. Newman decided Delton had great potential. Newman started life as newsboy in the 1880s. By the 1920s had become one of Chicago's better-known contractors, and was thought to be worth $30 million. He claimed he'd always been too busy to take a vacation until he saw the beauty of the Dells, and that's when he decided to make tiny, overlooked Delton into an ultra-modern vacation resort. He began by circling Dell Creek on a map and instructing a local agent to "buy up all that land within my pencil line." 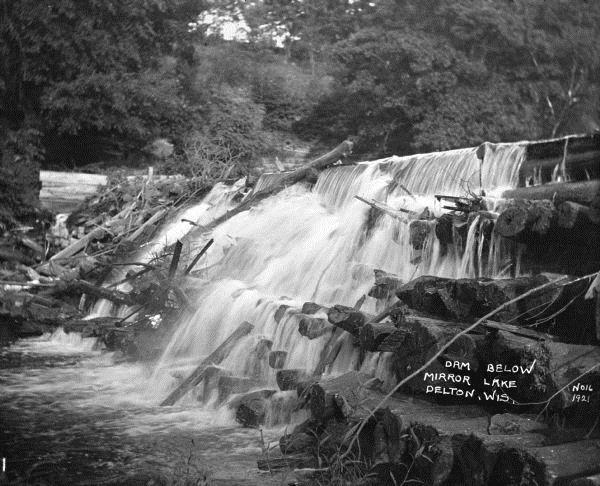 He brought engineers and laborers from Chicago to build a 30-foot high dam where the creek left the valley and entered the Wisconsin River. They also piled a 1,000-foot dike alongside the dam and sculpted hundreds of acres of artificial shoreline into prime tourist real estate. On July 27, 1927, Newman gave the order to let the pretty little valley fill up with lake water. At a banquet that night he said had invested $600,000 in the resort, and expected to put in another $400,000 before he was through. By then his state-of-the-art Dell View Hotel was ready for occupancy. 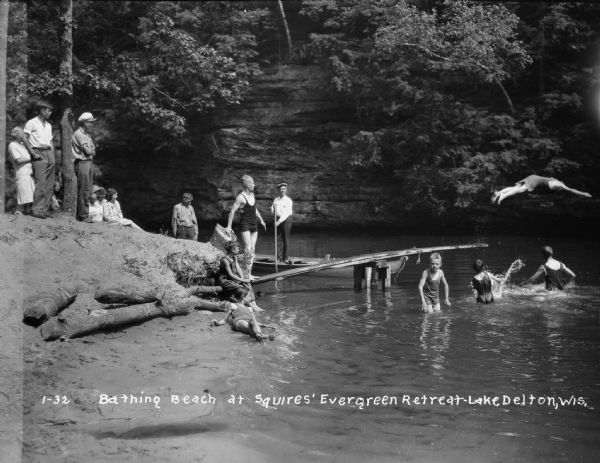 Promotional brochures described its bathing beach, golf course, trout pond, fish hatchery, hiking and horse trails, baseball diamond, amusement park, family cottages, and its nightclub. For as little as $2.50 per day, or $20 per week for an entire cottage, visitors could have comfortable modern accommodations from which to explore the entire Dells region. A lock enabled small motorboats to travel into Lake Delton from the Wisconsin River, an airport welcomed wealthy tourists from around the nation, and "almost numberless" summer cottages and more substantial homes soon sprouted up along the lakeshore. Unfortunately, all this happened on the eve of the Depression, and Newman's bubble quickly burst, during which time tourism declined and his contracting business slumped. A group of associates called the Lake Delton Development Co. assumed the resort's debts and kept it barely alive until the economy revived after World War II. That's when Tommy Bartlett arrived and turned the Dells into Wisconsin's premier tourist destination. Newman didn't live to see his dream reborn, though. He passed away in Chicago in 1943. The flood of June 9, 2008, was not caused by the failure of Newman's dam but rather by the collapse of County Highway A, along the 80-year-old earthen dike. Once breached by the swollen creek, the dike's banks melted away and were swept downstream, carrying three houses and portions of two others along with it. Within 10 months, the Lake Delton Dam improvements project was complete. It increased the dam's capacity by 214 percent, more than enough to accommodate a "thousand-year" storm event. At an average depth of 12 feet, the 264-acre man-made lake was refilled just in time for residents and visitors to celebrate Memorial Day Weekend, the traditional start of the summer travel season. [Sources: Besides the articles linked in the text above, we relied upon Michael J. Goc's excellent book, "The Dells: An Illustrated History of Wisconsin Dells" (Dells Country Historical Society and Michael J. Goc, 1999) and local newspaper accounts.